Alzheimer’s disease (AD) affects nearly 50 million people worldwide and is the most common type of dementia in seniors. It is estimated that by 2050, approximately 115 million people will be living with some form of dementia. With the prevalence of AD on the rise, the need for innovative research and therapies has never been greater. Developing these therapies relies upon clinical trials – but not without some challenges. 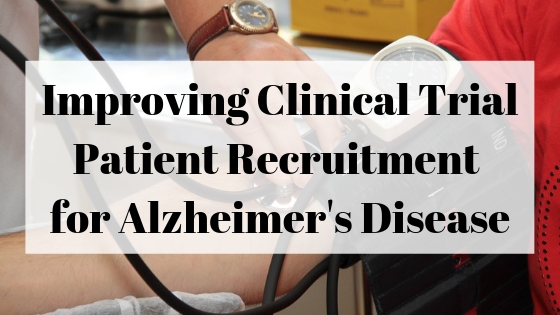 One of the biggest hurdles in clinical trials for Alzheimer’s disease is the recruitment and retention of patients. Finding study participants for this particular field presents its own unique issues. Firstly, it’s no easy task to bring in a surplus of seniors who are willing to volunteer for a clinical trial (any clinical trial). On top of that, participants a great deal to consider on their end including eligibility requirements, invasiveness of procedures, time commitment, and finding a study partner to accompany them through the entire process. The checklists and must-haves can simply be too much for some people. Recruitment criteria need to be carefully considered when seeking to enroll participants in an AD clinical trial. You want to make sure that you are enrolling only the patients that are truly suffering from the disease (compared to those with mild symptoms). Should a distinct difference exist between drug and placebo, this maximizes your ability to showcase the effectiveness. To boil it down to the ideal participants, you want to start by casting the largest recruitment net possible. Clinical trials have historically struggled to include people of diverse racial and ethnic backgrounds in their research. Unique obstacles for participation need to be carefully considered for these particular populations. Such barriers may include language restrictions, cost, level of invasiveness of procedrure, lack of ethnic or cultural representation, or a possible mistrust of medical establishments. If these patients would be ideal trial participants, do what you can to accommodate them and their study partners. The truth is that for many patients, especially those with an illness as severe as AD, clinical studies often take up too much time and require too many in-person visits. Therefore, it would make sense that the longer a study is and the more effort is required, the harder enrollment will be. In the U.S., about 85 to 90 percent of AD clinical trials experience delays in recruitment. Studies may want to consider opening up recruitment efforts to countries outside of the United States, with careful consideration of local regulatory protocol. A larger recruitment pool increases the chances of enrolling the necessary amount of ideal patients and keeping the study timeline on track. Successful clinical trial recruitment must be treated as a long-term effort. Awareness and outreach should be ongoing initiatives in the effort to achieve adequate patient enrollment. In addition to awareness efforts such as social media and SEO, form relationships with local physicians close to each site. Physicians can become trusted advocates help to deliver the message of scientific research and aid in making referrals. Remember that diversity is key. Partner with various physicians who care for patients across all racial backgrounds and income levels. Need help with patient recruitment for your clinical trial? Contact us here!